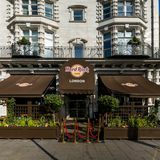 "Discover the place known for its authentic dining and world class entertainment when you visit Hard Rock Cafe London. 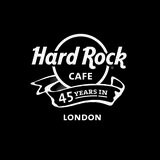 Standing on Old Park Lane since June 14th 1971, and proudly boasting a Mayfair neighborhood address, Hard Rock London was the first cafe where the classes mingled. With room for 220 guests, our spacious restaurant welcomes guests for delectable dining, incredible entertainment, and memorable events. After a delicious meal of American fare, take a stroll through musical history with iconic pieces of musical memorabilia you can only find at Hard Rock London. 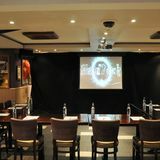 The final surprise to complete the London Hard Rock experience is our hidden 'Back Room Bar', seeing is believing!" You can book to reserve an area of Hard Rock Cafe for you and your friends. Just enter your requirements below to see what they have to offer. Check our website for up to date event and entertainment details. What did you think of Hard Rock Cafe? I found Hard Rock Cafe in Park Lane very pleasing, having been to quite a few Hard Rock Cafes across the country. I think they always have a really good, friendly atmosphere. They have some nice cocktails too. Yes, the food is quite fatty but there are healthier options too, like the salads or veggie burgers, if you ask for no dressing or mayonnaise, as they always put heaps on. Overall I think it's a fun place to go to start your evening off. A very cool bar and restaurant with friendly staff and great cocktails. I was invited down to Hard Rock Cafe for a party last Wednesday and what a great night it was! Enjoying tasty cocktails and gazing over the memorabilia draped over every wall is enough to keep you engaged for ages. Visited for lunch on 8th Feb, and just got in before they had to start a queue! As expected a good lunch, a little over priced, but that's London. Music, heavy rock, and just at a level to cause problems when trying to have a conversation, but I really like loud music, so hey ho. Highly commended Virgin Mary cocktail! What a suprisingly fabulous experience! As at a "I don't queue" stage of life, was a little gutted to have to organise a "birthday celebration" for a 16 year old. However the advice given was the best ever, buy a "Red Letter Day" (or Virgin experience or Buy a Gift etc) experience, then able to ring and reserve a time with The Hard Rock Cafe. Got there, bypassed horrendous long queue, got a buzzer thing, had a drink, did a little shop, buzzed and got seated! Amazing waiting staff, set menu pre-paid, but could add on anything else for separate bill, whole restaurant sang "Happy Birthday" to "now not too cool" 16 year old! Memories have been made and the girls will never forget such an amazing night. Oh and the food (coming from a bit of a food snob) was a rather pleasant surprise! We thoroughly enjoyed our visit to the Hard Rock cafe, and despite it been a Friday lunch time, we were seated straight away... The initial welcome was so warm and friendly and genuine...wish more establishments could achieve this! The lady who showed us to our seats was so lovely...she had studied in our home town and spent a couple of mins chatting with us...and then our waitress was also super friendly and great with our daughter! She joined the kids club and even got a free dessert! Our food was tasty and good value, and very generous portions...we all left full! A great visit, will def be back! Good food, great atmosphere, fab value and amazing service!! We arrived at Hard Rock Cafe around 8.30 PM. They said it was 1 - 1,5 h waiting but we were welcome to sit at the bar while waiting for our table. We ordered our drinks and the bartenders were great. I have never understood the fuss about Mojito until I tried one at Hard Rock. Absolutely amazing! We tried a couple of classic drinks - Mojito, Strawberry Daiquiri, Piña Colada, and they were all excellent. We all took the New York Strip Steak as entree and it was delicious. The staff was very friendly and professional and we got very well taken care of! Hard Rock Cafe is a must do, especially when you are in London. If you don't want to/can wait for a table - go earlier. But if you have the time - their fabulous drinks are definitely worth it. Enjoyed a family birthday treat . a meal at the hard rock cafe. Very busy even early in the evening with every seat taken and a queue outside waiting to enter. The atmosphere was electric with a real buzz about the place. The service was prompt as there appeared to be lots of attentive staff ready to please, Service with a smile seemed to be the order of the day. The food was plentiful and appettising . A memorable treat. Attended Hard Rock's Super Bowl party last night and was really impressed. i thought it was only for tourists but they put on a great night. Great screens to watch the game, lots of food and beer and Cheerleaders! Went to the Hard Rock Cafe in London in July 2012, I must say it was truly one of the greatest experiences I've had in eating out! Because it was so busy we had to eat outside where it was cold and wet but there was a sheet protecting everyone from the rain which was good. The staff were incredibly nice and professional and definitely knew their stuff when it came to the food. I had the Hard Rock Nachos to share with my mum which were simply the best nachos I've ever eaten, the beans that came with it were just gorgeous! For a main I had the Legendary 10oz Burger with Fries. Out of all the places I've eaten, it was simply THE best burger I've ever had, it was cooked properly and tasted pure, so well done to the chefs. I had a Hot Fudge Brownie for a dessert which was tasty but by this point I was simply too full, so sadly I couldn't finish it! Would like to eat inside next time I go back, as the atmosphere was buzzing and I loved the music videos they played on the monitors. I also paid a visit to the Hard Rock Cafe shop next door where I bought a pilsner glass and a hat. Thanks for making my day Hard Rock Cafe, can't wait to pay another visit! Love this place! Not only is the food amazing (I had the Legendary Burger - HUGE!) I only had to wait 15 minutes to get a table. Well worth it. Love Hard rock! Have only ever been to Manchester store before but was blown away by the London store. Service was incredible, our waitress Danni was very attentive to our needs and couldn't be happier to go that extra mile for us. Food was great, I had the pulled porky sandwich which is incredible! Would recommend it. Cocktails to die for, purple rain is the bomb! Had so much fun at hard Rock last night, I had the Texan burger - wow bigger than me! Had a great server who entertained us all evening with her banter! Keep rocking! Went to Hard Rock on Saturday evening for a friends birthday and was worried as i've heard about the long wait times. When we got there, the host gave us a buzzer while we waited and sent us off to The Vault Museum. WOW! I never knew this existed - its a bank safe room thing filled with cool guitars and Madonna's cone bra! Loved it, and took our mind off waiting (which wa sonly 30 mins in the end) LOVED IT!! My first experience with Hard Rock Cafe was on a family holiday to San Francisco back in 2001 but sadly I didn't get the chance to go back to one until quite a few years later and its was the slightly closer to home London branch that we visited and I'm glad that we did. Despite being a little pricey the food is always well cooked and delivered by some of the most cheerful and helpful waiting staff in the business (this is a tip for waiting staff elsewhere, I always tip well in H. R. C because the staff always appear to actually care that we are enjoying ourselves!). 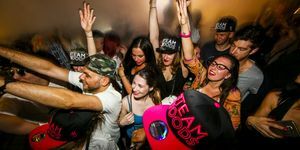 Every-time we've been there we've always had a fab time as the atmosphere has been top notch and they normally play songs that you know so you find yourself tapping your feet and admiring the beautiful memorabilia collection that they've got stashed around and between the tables. Since that first visit we've been to 7 different H. R. C's across the globe but we always come back to the London one as in my opinion, it's the first and still the best. :)p. S. If you have time, try to get across the road to the Hard Rock Vault (in the basement of the Hard Rock Store), the tours take about 10mins and if you are a Rock N Roll fan its well worth seeing some of the bits they've got stashed away in there. Not been to a Hard Rock Cafe in years and was blown away by the food, service and staff! The staff were so friendly and helpful and their knowledge of all the guitars etc on the walls was outstanding. If you are a rock 'n' roll fan you should definatly take time to come here. They also have a speical area under their shop which has a very rare Jimmy Hendrix guitar which made my son's day as he is his idol! Yummy food...go hungry as there is lots of it! Visited the Hard Rock last night for a friend's birthday - fantastic night!! Not only did I eat my dinner sat beside my idol Madonna's leather jacket but food and service surpassed all expectations! We also managed to get a free tour in the Vault Museum - If you're a music buff this is highly recommended!! Just need to find an excuse to visit again very soon now...! I've just come back from Amsterdam- what a great Hard Rock they have there! I love the one in London too for it's busy atmosphere but Amsterdam's cafe has a chilled-out vibe that truly matches the equally chilled-out vibe of Amsterdam. The cafe there is on a canal and you can watch boats go by as you sip your cocktails and munch on a plate of nachos. If you are looking for great service and a good meal, I'd recommend either of these cafes. Hard Rock Cafe. For families who like to eat fat. The waiters at the Hard Rock Cafe are very warm and, if you decide to celebrate birthdays there, they will be happy to help you out. The bar is very compact though but the food surpasses it all. I was not impressed with this restuarant at all. 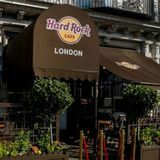 I have been to the Hard Rock Cafe in Amsterdam and was well impressed there but the London one does not live up to expectation in any way. We booked for a table and then still had to wait quite a while to be seated. Once seated, we were rushed into ordering our drinks and food. I ordered a Pig sandwich which came with chips that were cold, the breadroll was stale and the sandwich was fairly tasteless. I had one beer and a Pickled Tink Cocktail which really just tasted of flavoured ice! All this came to about £20, service charge already included, which I was obviously loath to pay. I would not recommend this restuarant to anyone. Think the Hard Rock Cafe is just another tacky American diner? Think again. This place is special; if Elvis were still alive, this is where he’d have his birthday party. The location of rock and roll beacon, London's Hard Rock Cafe, might come as a surprise. The restaurant is in the affluent Mayfair, just a few minutes from Green Park Station. The story goes that Hard Rock was one of the first burger joints in London, started up by two Americans - Isaac Tigrett and Peter Morton - who found England's class system bizarre. They wanted to open a restaurant where anybody, however much money they had or whatever their postcode, could have a good burger and a beer. Well, what better place to make that statement than Mayfair? Now first things first, make sure you're on the correct side of the road when you start walking up Old Park Lane (don't cross over when you leave the station) - you'll be walking for a very long time as there are no traffic lights or subways for miles and this is a huge road. You'll probably know you've arrived, though, by the line of people waiting outside the restaurant. This place has had them queuing ever since the 1970s. This is the first Hard Rock Café, and inside above the bar you’ll find Eric Clapton’s guitar – the one that he ‘donated’ in 1979 in order to make sure there was always a table for him. The idea caught on and soon rock stars were sending in their memorabilia in return for a queue jump. The walls are now covered in instruments and clothes, and each one has a story that the staff are only too happy to tell you. There are two bars, and lots of large tables and booths. The walls are also covered in televisions, playing the accompanying videos to go along with the music played over the loudspeakers. The Hard Rock Café has a real buzz about it. Far from tacky, it feels impossibly cool eating your burger and fries surrounded by Ringo Star’s drum kit and Roger Daltrey’s outfit from Tommy. The service is faultless – the staff’s knowledge and passion is commendable and you’ll always be served with a smile and a bit of history lesson. Naturally this is a tourist hub – how could a place so steeped in rock lore not attract people from miles around? Next door to the restaurant is The Vault, a small museum filled with more memorabilia. Be sure to get a free tour before or after your meal – it really adds to the experience. The ‘legendary burgers’ are truly delicious. For £13.75, choose from The Big Cheese, the Classic Patty Melt and ten more, all served with tasty home made chips. If burgers aren’t your thing, there’s also Bar-B-Que ribs, chicken sandwiches and salads. Carbs are in plentiful supply. Initially a ‘beer and burger joint’, Hard Rock serves plenty of both. There are several brands on tap, including Stella, and you can enjoy a pint at the bar while waiting to be seated. Cocktails, at around £11 each, are spectacular – for a bit of theatre try a ‘Pop Diva’, which comes with a packet of popping candy. A legendary concept that’s led to a sprawling global franchise, go to the original Hard Rock for the tasty American fare and you’ll end up staying because you can’t take your eyes of Freddie Mercury’s guitar.